The Suneden Sensory Playspace is demonstrative of what can be achieved on a modest budget, when landscape architects re-imagine standard building material into amazing new play opportunities. Suneden Sensory Playspace is the result of the imagination and innovation WAX Design and the local community. 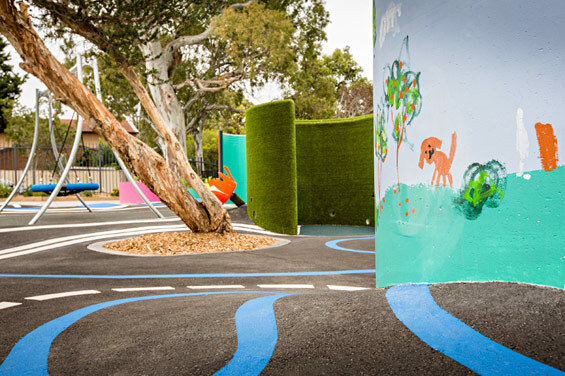 Using a tiny budget and community support, WAX Design has created an amazing 200m2 playspace that excites, simulates and challenges the various abilities of the students at the school. The unique and entertaining designs use a host of standard building and landscape material to create a series of outdoor rooms that incorporate explorative and sensory activities that help to improve student’s body awareness, problem solving, cognition, creativity, enhance their overall learning abilities and above all increase their happiness. 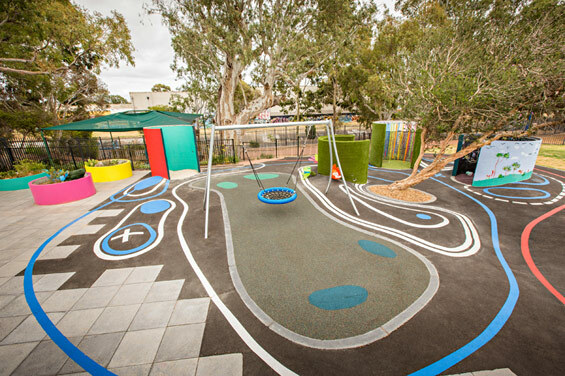 The Suneden Sensory Playspace started as a simple request to install a piece of play equipment at Suneden Special School. During the preliminary discussion between WAX Design and the school, the potential project as well as the needs of students became apparent. The existing play ground consisted of a neglected swing, shed, bark mulch and paving. The school, children and parents were desperate to enhance the experience and enjoyment of the children with both intellectual and physical disabilities who attend the school. 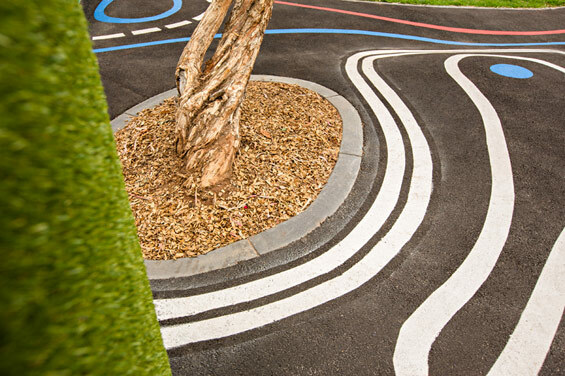 Built over 5 weeks on a site measuring just 200m2 , the Sensory Playspace is a result of the imagination, innovation and hard work of WAX Design, Suneden School, Summit Landscape and the local community. 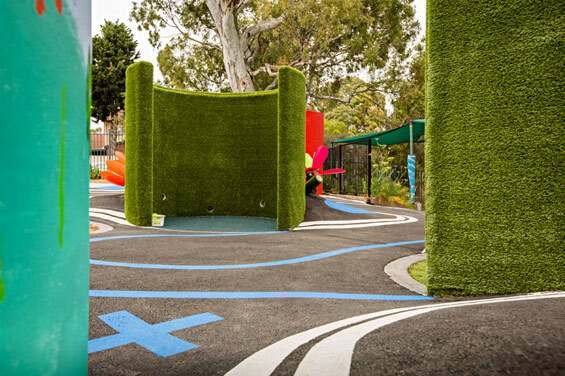 Using a small budget of $50,000 AUD and a lot of community support, WAX Design has created an amazing playspace that excites, simulates and challenges the various abilities of the students at the school. The unique and entertaining design use a host of standard building and landscape material to create a series of outdoor rooms that incorporate explorative and sensory activities that help to improve student’s body awareness, problem solving, cognition, creativity, enhance their overall learning abilities and above all increase their happiness. WAX Design has re-imagined four concrete pipes to create a series of circular rooms which provide spaces, in which children can play, socialise or retreat. Covered with artificial turf these large pipes become grass rooms with tactile surfaces that children can interact with. The addition of a curved chalk wall to one pipe allows children to work together and create ever changing art works. 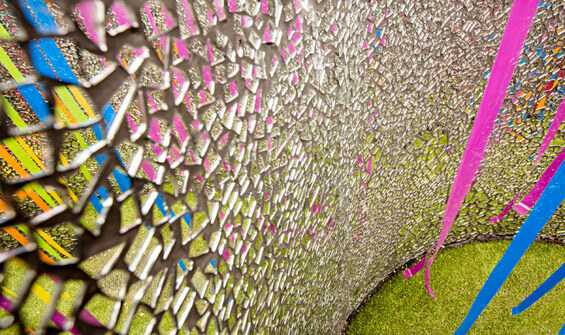 In another pipe, the surface is covered with a mirror mosaic, creating the effect of being a giant mirror ball where the world is ‘literally’ reflected around you. The pipe’s surface creates a wall of light and colour that surround and response to your every move. 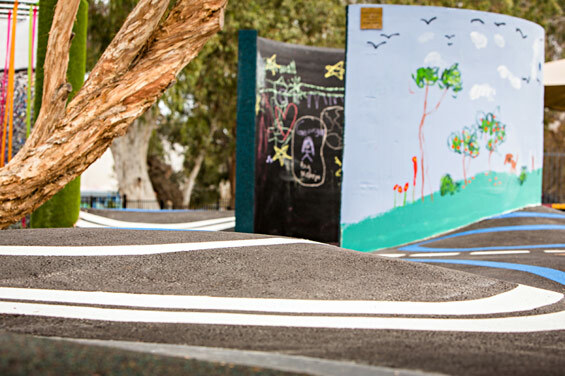 The ground surface of the playspace consists of rubber softfall areas and bitumen. Both of these materials are profiled to create mounds and other topographic changes. 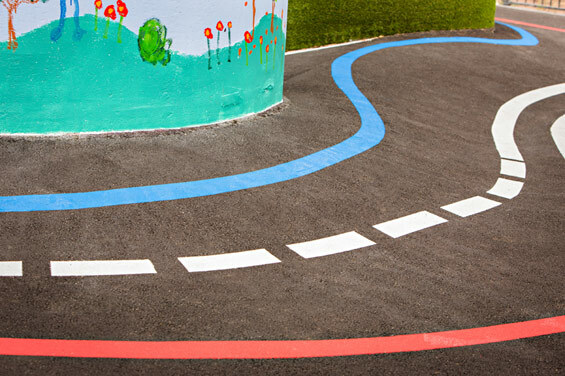 The application of coloured line marking and super graphics across the surface enables the surface to become a giant games board with children using the lines and symbols to play chase, follow-me-leader and various other games. For children with visual impairment the line marking demarcates level changes in bitumen which they may have to negotiate. 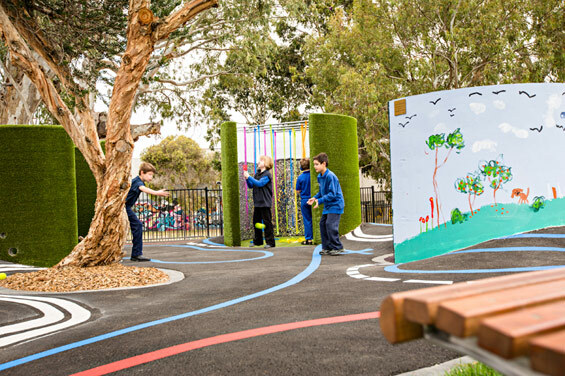 Numerous stormwater pipes create connections between the outdoor rooms and act as talking tubes allowing children and teachers to communicate and interact, while reconfigured irrigation piping connected to the mains water supply provides water play opportunities. The playspace also includes a basket swing which provides opportunities for active play as well as relaxation and seating for children of any ability. The Suneden Sensory Playspace is demonstrative of what can be achieved on a modest budget, when landscape architects re-imagine standard building material into amazing new play opportunities.